Heat oven to 400F degrees. Line large sheet pan with aluminum foil or parchment paper. Add olive oil to a pan. Pat dry chicken with paper towels to remove extra moisture and place in oiled pan. Toss to coat on all sides. Add potatoes and veggies and sprinkle with salt, ground pepper, and garlic. 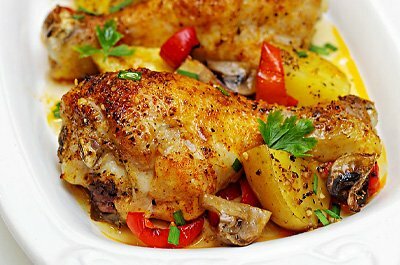 Bake in the oven for 45 minutes to an hour, or until the juices run clear on the chicken and potatoes are cooked. If the chicken and potatoes have not browned up as much as you would like, turn the broil setting on the oven and broil for 3 to 5 minutes. Watch carefully, or they will burn.